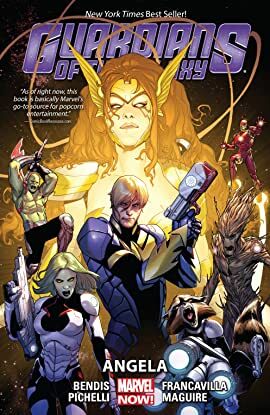 Collects Guardians of the Galaxy #4-10. 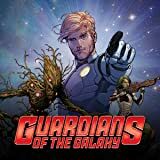 Spinning out of the dramatic conclusion of Age of Ultron, dimensions collide and Heaven's most fearsome Angel arrives - and comes straight for the Guardians! Gamora, one of the galaxy's greatest warriors, holds a deadly secret that could bring down the entire team. And when Gamora battles Angela, the entire universe hangs in the balance! Then, the galaxy's most mismatched heroes find themselves at a crossroads when the effects of Infinity begin to rise. Can even the mysterious Angela's power help combat the fallout from Thanos' master plan? And what will it take for Star-Lord to betray the entire Marvel Universe? The biggest blockbuster hit of the year continues as critically acclaimed artists Sara Pichelli and Francesco Francavilla climb aboard...and comics legend Neil Gaiman joins the team in this one-of-a-kind comic book event!